I want to start my speech with reference to an incident that took place in Jaffna on the 16th of December 2016. Where a bus-van collision led to the deaths of 11 Sinhalese travelling to Chavakachcheri, in the North of Sri Lanka. The Tamils who arrived at the scene did everything to help the wounded Sinhalese. The touching scenes were relayed by media. It takes a brave few like those who helped the victims and those who held candlelit vigils for the deceased, to awaken the rest of the community to the true status quo. Only 7 years had passed since defeating one of the most brutal Terrorist organizations in the world. The LTTE were responsible for the invention of the suicide bomb and were widely regarded as one of the most inhumane practitioners of warfare. The military action was against Terrorists not the Tamil people. The defeat was not of the Tamil people. Victory is not for the Army. It is a victory of people to live together. Peace was delivered to all the People, be they in North, East, West or South of Sri Lanka. It takes time and effort to heal all the war wounds, but the brothers and sisters of the Chavekachcheri Tamils showed us that the reconciliation process that had been in progress since the war ended in 2009 was working. I would like to share another story. When a daily news paper quoted on the 13th June 2017 that the Jaffna Teaching Hospital Director had said that caste differences among the people living in the North were discouraging them from donating blood, thus resulting in a shortage of blood for transfusions at the Hospital. It was the Sri Lankan Army who came forward with 200 soldiers to donate blood. 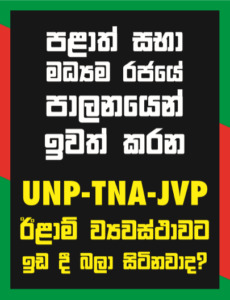 These are the very soldiers that the TNA, the Chief Minister of the North, and the Opposition Leader together with LTTE fronts, have been humiliating, even claiming that they were responsible for genocide, calling for war crimes tribunals, demanding that these soldiers be removed from the North. In a land of Racial Discrimination would you find people of different races coming together spontaneously at a time of need? What is this so called discrimination that the Tamil Expatriates and a few Tamil political leaders from Sri Lanka and Tamil Nadu, India are talking about when constitutionally and economically Tamils in Sri Lanka enjoy a higher share than their demographic percentage? To give a few examples, there are currently 33 Tamil MPs in Parliament; the Opposition leader is the leader of TNA, which was the political wing of the LTTE, and the current Governor of the Central Bank, is also a Tamil National. There are many Tamil academics and scholars, who hold prestigious posts in many Universities and other Institutions. Tamils Diplomats, Journalists, Judges and public servants are numerous, and many are being respected as citizens of Sri Lanka, without prejudice. Many of the largest businesses in Sri Lanka, which are mostly based in the capital, are owned by Tamil People. For example the two most successful supermarket chains are owned by Tamils and frequented by Sinhalese majority. The Sri Lankan Tamils have the luxury of enjoying all their religious and cultural holidays, like Pongal, Mahasivarahri and Deepavali unlike their expat counterparts. Sri Lanka is one country that has given equal language status to a minority language. Tamils of Sri Lanka make up only 11.2% of the population. Sri Lanka has a separate colour to depict Tamils and Muslims in the country’s national flag – has India shown such a gesture when 9/10th of the world’s Tamils live in India? Healthcare and Education are basic human rights and is equally and freely accessible to all citizens of Sri Lanka regardless of their ethnicity. While Tamils can live, buy property, indulge in business, and educate their children throughout Sri Lanka who can claim being discriminated? These false allegations and fabrications of discrimination do exist, as a desperate measure to seek help from international bodies to federate the beautiful island of Sri Lanka by Separatists Tamils. These very same separatists have openly supported the LTTE in their goal to create a mono ethnic Tamil enclave. Tamil Separatism started during the time when the British colonized Sri Lanka. The colonists, who mastered on ‘divide and rule’, encouraged Separatists to work against the Sinhalese representation in the constitutional council. A few years later in 1939 during British rule when GG Ponnambalam demanded 50-50, his demand was for 50% of parliament seats for non-Sinhales and the balance 50% could be for Sinhalese and the non-Sinhalese. That was the Discrimination that our fore fathers had fought and defeated for the sovereignty of our motherland. It was in 1949, immediately after the independence of Sri Lanka that Chelvanayagam formed the first racist party in Sri Lanka called Ilankei Thamil Arasu Kachchi – the direct translation being Sri Lankan Tamil state party demanding a federal state for Tamils. Later Vaddukoddai Resolution was formed in 1976, seeking a separate homeland for Tamils by TULF. The difference between Prabakaran and the separatists before him was that he used the most gruesome methods of terrorism against the Sinhalese. Using his own Tamil people, which included women and children as weapons and human shields to fulfil this same dream of Eelam to divide and rule. LTTE’s discrimination against their own people had started by killing Tamil policemen, politicians and numerous other Tamil civilians whoever had the guts to oppose terrorism. Riots of 1983 in Colombo following the killing of 13 soldiers were by thugs who looted and destroyed. This black mark caused upon one of the most generous Nations, generous I would say because even on the day of black July, every one of us brought home our Tamil friends, to protect them from this unbearable hooliganism. LTTE used this day’s horror to strengthen their war tactics getting sympathy and support from the international community. Expatriate Tamils of Sri Lanka still use 1983 to claim impunity without considering the repercussions they are bringing to their motherland and to their relatives that are back at home. That is the discrimination that the Tamil diaspora is creating for their own people to seek asylum for greener pastures. If I were to name the numerous terrorist attacks of LTTE on Buddhist monks, civilians at worship, innocent villages, farmers, unarmed police, the forces and thousands of civilians, I would be here the whole day. What I want to emphasize is that even with the continuous attacks on the citizens of Sri Lanka, be they Sinhalese, Tamils or Muslim, there wasn’t a single civil retaliation. The Tamil expatriates and the international Community have advantageously overlooked this. On the 19th of May 2009 the Forces of the Sri Lankan people defeated Terrorism. With that the aspirations of Separatists were defeated. The apparition of Eelam was defeated. After the war ended in 2009, the development of the North and East was the primary focus due to the lack of it in the past 30 years. LTTE was ruling a de facto state in the North. According to Janes Intelligence LTTE was making $300m profits annually but LTTE did not make a single road in the areas they ruled. The LTTE did not spend on building a single school, did not allow children to study – they were kidnapped and sent to LTTE orphanages where they were trained in armed combat. Even at the height of the war, the Government of Sri Lanka ran classes for IDP children preparing them for O-Level-GCE examinations. The LTTE discriminated against their people, but this has been advantageously forgotten and ignored. It is only after an era of peace has been established that the UN human Rights Council demand a constitutional change in the name of accountability and reconciliation. Accountability and reconciliation are ideologies backed by World’s super powers that are looking to divide the sovereign states in advancing their country’s need to be a Hegemonic power. The demands of the UN Human Rights Council Resolutions are infringing and violating the UN Charter and exceeding the UNHRC mandate. The demands of the UN human rights resolution are fundamental, that they cannot take place without constitutional reform. Fundamental change cannot be proposed without radical ideas and thoughts. These thoughts are the false allegations of discrimination and racism against minority groups in Sri Lanka. Seeds of radical thoughts have been planted and fermented by those that seek to colonize the world in the modern era. A select few individuals can be brainwashed to ensure the destabilization of countries into mono ethnic enclaves with a promise of an independent state which will finally lead to a never–ending conflict between those divided. May I remind this forum that the newly created ‘independent’ states of Kosovo and South Sudan are failures of the UN System. Sri Lanka does not wish to enter this list.